Imagine the satisfaction of completing your first half marathon. Then imagine the satisfaction of beating that finishing time and setting a new personal record. Then double all that satisfaction and you just might get to the level of satisfaction I felt as I watched my 14-year-old and my husband complete their first half marathons at the Fontana Days Run last weekend! About five months ago I encouraged Mike and Shannon to start training for a half marathon. I chose the race, the Fontana Days Run, because it offered a gentle downhill profile, the timing was right with the race taking place on June 4 a week after Shannon graduated from 8th grade, it was inexpensive for a half marathon, it was just a 45-minute drive from our house, and we could pick up our race packets on race morning. I wrote out a training plan for Mike and Shannon to incorporate into their busy tennis schedule. They play 10-15 hours of tennis per week, so I figured they could get by with three runs per week: two shorter runs of 4-5 miles (one easy, one with some hills or informal speed work) and one long run on the weekend that gradually built to a 13.1 mile training run and tapered to an 11.7-miler and a 6-miler in the two weeks before the race. Everything seemed to go well in training, although I had no idea what pace they should target for the race. Shannon set the pace for the long training runs, and that generally averaged out to about 11 minutes per mile. I knew Mike and Shannon wanted to break 2 hours for their finish time, and that would require a pace of about 9 minutes per mile. Could they really run two whole minutes per mile faster in the race than they ran in training? I encouraged them to go out at a comfortable pace and not let their legs fly too fast on the initial downhill (the race has a drop of 2,125 feet from start to finish). 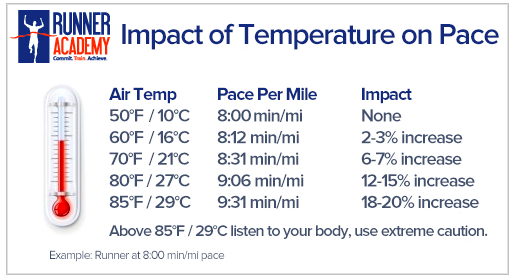 So I expected them to run about 30 seconds per mile slower in the heat than they could have if we’d had ideal race day temperatures. As you can see in this photo of me it was quite sunny at the start. Without fanfare or much warning at all, really, the starting gun went off and Mike and Shannon set out at a comfortable pace. I carried my iPhone and used the MapMyRun app to keep track of our pace, but I kept the data pretty much to myself the whole race. The first few miles of the course run down the road through the San Bernardino National Forest and it’s simply gorgeous! After the first few miles though we were in full sun and by mile 5, I really started to feel it. There were adequate aid stations but some just had water and not Gatorade. Thank goodness I brought my own sports bottle and could refill it at the aid stations every 3-4 miles. Given the unusual heat that day, the volunteers drove around in a golf cart and handed out wet washcloths which I appreciated. I coached Shannon to run through the aid stations and just grab a cup of water and dump it on her head. Then I handed her my bottle of Gatorade to drink every mile or so. This worked very well. Mike ran just slightly ahead of Shannon and me, and he seemed to have an internal, innate sense of pace. I mean, just look at the consistency of these splits! The course is downhill but it’s so gradual that it never feels taxing. The last seven miles are a straight shot into the town of Fontana, which means you don’t have to worry about running the tangents. It’s not the most scenic, but it’s fantastic for a PR attempt or a first-time race. By about mile 10 I knew that Mike and Shannon could come in under 2 hours, and I started encouraging Shannon to keep up the pace and not let off. She had the best attitude the entire race and never complained. We caught up to Mike around mile 12 just as his calves started cramping due to not taking in enough Gatorade. I passed him my bottle and he was able to revive and keep running. Shannon sprinted to the finish to come in at 1:54:21. I was one second behind her with a huge grin on my face! Mike clocked 1:54:49. A happy Mike at the finish line (and some random guy’s rear end. My photography skills can use some work). I could not have been more proud of Mike and Shannon. They blew away my best hopes for them and did not seem at all affected by the heat. And for the icing on the race cake, Shannon came in first in her age group! Later in the week, I interviewed Mike and Shannon separately about their experiences. I probably should not have picked the day of their peak soreness (delayed onset muscle soreness peaks about two days after the race). They didn’t have much to say, but what they said warmed my heart. Me: Are you glad you did the race? Me: Did you meet your goals? Me: Would you do another half marathon? Me: How did I do as your coach? Mike: You were A+. It made it easy. It made it so we could not fail. We were going to meet our goals no matter what. I give you 99% credit. Ahhhh! What a relief. They had a great race, came out of it uninjured, and were happy with the results. And for those wondering about whether or not it was a good idea for a 14-year-old girl to run a half marathon, I can say in our experience it was a very positive, safe, healthy experience for her. She had a checkup with her pediatrician this week including blood work done, and everything came back normal. And today, only 6 days after running the half marathon, Shannon won the Girls 14 and under division of the 18th Annual Laguna Niguel Junior Open Tennis Tournament! The newest race on my calendar is one of California’s oldest races — the Fontana Days Run Half Marathon, which was first held in 1955. The race takes place on Saturday, June 4, 2016. That’s over five months away, so why have I already registered? Well, a few reasons. (1) Registration is (relatively) cheap right now — just $50 plus the online registration fee. (2) I am a planner. I like crossing it off my to do list and not having to remind myself all the time to register before the race sells out (the horror!) And (3) — this is the big one — I also registered my husband and my oldest daughter for the race! For each of them it will be their first half marathon. I feel if you are going to take on the 13.1 race distance, it’s very motivating to commit to the race, not just wait and see how the training goes. Having that race on the horizon holds you accountable and makes it more likely that you will get out the door and complete the training miles. We’ve already started training together — not so much following a half marathon training plan but a training plan I put together to get them building up to running enough miles each week that they are ready to start the 8-week training plan in April. So far the farthest my daughter has ever run/walked in one workout is 5.5 miles. Come to think of it though, she has run a 5K (PR of 24:11) and then gone right back out on the course to run it again about half an hour later — so you might count that as a 6.2-mile run. That was last May though, and now she’s working up to running about 11-12 miles per week and slowly building from there over the next five months. By June my daughter will be 14 years old and my husband will be 45. I’m proud of them both for taking on this half marathon challenge! Have you run a half marathon? I’ve run five half marathons over the last four years. When was your first half marathon and what was it? My first half marathon was the OC Half in May 2012. What’s your favorite half marathon course? I loved the REVEL Canyon City Half Marathon in 2014 and the Fontana Days Run Half Marathon has a very similar course — a beautiful run down a mountain through a national forest.